San Marino, said to be the world's oldest surviving republic, is one of the world's smallest countries and the third smallest country in Europe, with only Vatican City and Monaco being smaller. In a population of roughly 35,000 Sammarinese people, they are serviced by 3 mobile operators. Telefonia Mobile Sammarinese (TMS) : It is a telecom company that provides several communication services like GSM (900/1800 MHz), GPRS, EDGE, UMTS (900/2100 MHz), HSDPA, HSUPA, HSPA+, DC-HSPA+. There are 0.019 million subscribers in 2012. The company share is owned by TMS. TIM San Marino : Founded in 1992 and headquartered at Falciano provides communication services like GSM (900/1800 MHz), GPRS, EDGE, UMTS (900/2100 MHz), HSDPA, HSUPA, HSPA+, DC-HSPA+, LTE (800/1800/2600 MHz), LTE-A. The company share is owned by Telecom Italia San Marino. San Marino Telecom (SMT). : A telecom company that provides several communication services like GSM (900/1800 MHz), GPRS, EDGE, UMTS (900/2100 MHz), DC-HSPA+, LTE (800/1800 MHz). The micro-state signed a memorandum of understanding last year with Italian telecoms group TIM to become a 5G guinea pig. Since it only consists of 61 sq km and has more relaxed laws on airwaves it is a far more suitable testing ground for 5G than surrounding Italy. Small territories have been used in the past for telecoms testing. The first 3G trial in the UK took place on the Isle of Man, while the remote Isle of Bute in Scotland was used to test “white space” technology. Giovanni Ferigo, head of technology for Telecom Italia Mobile, said San Marino’s 5G network would be the first in Europe “for sure”. Mr Ferigo said the work done in San Marino would play a critical role in the future of 5G technology in Italy but was also crucial to the wider European sector as standards for the new network are refined. He argued that Europe was central to the development of 2G technology but lost that leadership position to Far Eastern carriers in 3G and to the US for the 4G upgrade. “For 5G, our intention is a European leadership in standardisation,” he said. This has now resulted in the activation of the first 5G network hubs in San Marino, in partnership with Nokia and Qualcomm, which included a millimeter wave 5G mobile test device using the Snapdragon X50 modem. According to Cesare Pisani, TIM San Marino CEO. “Today we have reached a new important milestone, which confirms TIM’s ability to be a leader in innovation processes in the sector, a role we also play at global level, contributing to establishing the 5G standard. By enabling new generation services in San Marino, we are looking forward to the future, paying particular attention to the development of innovative services related to public safety, transport, tourism and Industry 4.0 which enable the Smart City model”. Digital tourism services which, using Virtual Reality solutions, allow to explore remotely local sites of artistic and cultural interest, providing an immersive experience. 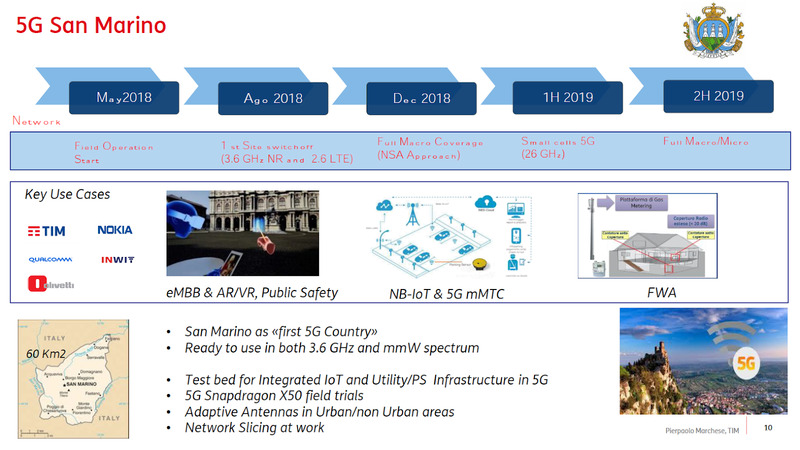 The gradual adaptation of the 5G network will enable the creation of an ecosystem of local partners, including government bodies of the Republic of San Marino, the University and Research Centres, the Social Security Organisation, the National Tourism Office, Service and Production Companies, the Police Force, with whom TIM will test innovative 5G services for Smart Cities, Public Safety, the Environment, Healthcare, Tourism, Culture, Transport and Media. Last week, state of San Marino chose ZTE to implement the new state public network and implement a series of technologies for the provision of new-generation services in the smart city sector. The creation of a training center for TLC (San Marino Telecom) technicians and experts is also planned. Spotlight on Expo 2020. More details (in Italian) here and here.